Good Monday to you all, the Market Report provided by Darel Ansley of Peoples Bank is up on the blog. Of note is that First American, a provider of services for real estate transactions, said their latest Real Estate Sentiment Index found nearly 87% of first-time buyers were 26-35 years old--aka millennial's! Their chief economist also said, "This month's increase by nearly 4,000 residential construction jobs...sends a positive message, ...as it indicates further increases in housing starts are likely and more housing supply may be on the way. "Last week one of our clients asked me what I thought on the real estate market, and his remark is that it is gonna burst and he buying at the top of the market, who knows, he could be right, this is my 15th season in real estate, and you learn every day. The one trend I told our client is that I don't see people buying 2-4 homes and not living in them like 2004-2007 brought us, whereas 99% of our buyers are living in their home as their primary or second home. Secondly, Seattle is trending the nation in new jobs and housing and apartment starts...which is drawing in migration, which in the beginning will likely rent, but this is not New York, people in the West tend to want to own, so the pressures on housing may be delayed or tampered a bit, but the demand will likely turn as people know real estate is a good long term investment versus renting, historically speaking. 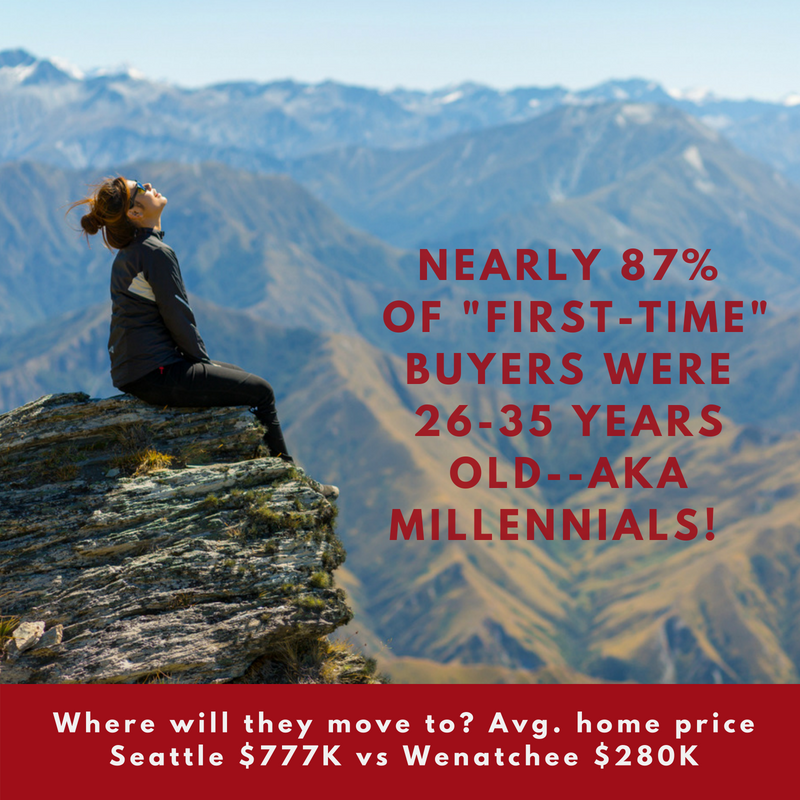 INFO THAT HITS US WHERE WE LIVE... First American, a provider of services for real estate transactions, said their latest Real Estate Sentiment Index found nearly 87% of first-time buyers were 26-35 years old--aka millennials! Their chief economist also said, "This month's increase by nearly 4,000 residential construction jobs...sends a positive message, ...as it indicates further increases in housing starts are likely and more housing supply may be on the way." Freddie Mac's chief economist noted, "A record number of people quit their job last month, most likely for...higher wages and better benefits. This positive trend, along with these lower mortgage rates, should increasingly give...homebuyers the financial wherewithal to resume their home search." BUSINESS TIP OF THE WEEK... Describe your ideal prospects, then target your marketing to them. When you know who you're looking for, it's way easier to find them--and speak to their needs. BRING ON THOSE Q2 EARNINGS!... Stocks rallied for another week, driven by investor optimism about Q2 corporate earnings. The S&P 500 hit its highest level since February, the Dow zoomed back over 25,000 and the Nasdaq reached a new record. Q1 saw S&P 500 earnings almost 25% above last year. Wall Street expects another quarter of double-digit earnings growth, thanks to tax cuts and a healthy economy with surprisingly strong job growth, averaging 215,000 new jobs a month during the first half. July's preliminary University of Michigan Consumer Sentiment index dipped to 97.1, but that's still pretty high. The index average since inception is 85.4--87.6 in non-recessionary years, 69.3 in recessions. CPI inflation rose a mild 0.1% in June. The week ended with the Dow UP 2.3%, to 25019; the S&P 500 UP 1.5%, to 2801; and the Nasdaq UP 1.8%, to 7826. Bond prices hung in there by and large, despite soaring stocks. The 30YR FNMA 4.0% bond ended down just .08, to $101.98. In Freddie Mac's latest Primary Mortgage Market Survey, t he national average 30-year fixed mortgage rate ticked up slightly . Remember, mortgage rates c an be extremely volatile, so check with your mortgage professional for up-to-the-minute information. DID YOU KNOW?... Fannie Mae reports 40% of all home owners are Baby Boomers born from 1946 to 1964, inhabiting 32 million homes. People born earlier own another 14 million homes, with the combined total worth an estimated $13.5 trillion. HOMEBUILDING MIXED, RETAIL AND MANUFACTURING GROW... Analysts expect June Housing Starts to be off a little, but Building Permits should edge up. Retail Sales are forecast on the increase, along with the Philadelphia Fed Index of manufacturing activity in the Mid-Atlantic region. Forecasting Federal Reserve policy changes in coming months...Wall Street still says we'll have no Fed rate hike in August, a small one in September, then none in November. Note: In the lower chart, a 2% probability of change is a 98% certainty the rate will stay the same .